Produced by Chris Standring for Ultimate Vibe Recordings 2016. 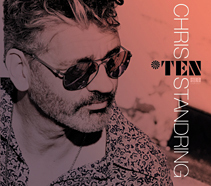 Over 15 years since first dazzling the contemporary jazz world with his breakthrough 1998 set Velvet, Chris Standring still revels in his restless creativity, discovering fresh, freewheeling and innovative ways to share his passion for groove, melody and dynamic guitarisma. Celebrating the remarkable milestone of album number Ten – an ever evolving catalog that includes the 2011 re-issue of his 1989 first indie recording Main Course (The Early Tapes) - he’s still got the cool, trippy sonics happening via a colorful fusing of live instrument and DJ sounds. But this time, while keeping his melodies, rhythms and arrangements as infectious as ever, the British born, L.A. based hit maker fashions them as the vehicle for him to unleash his deeper chops as a powerhouse jazz player and improviser. Soloing with a wild abandon he’s been holding back way too long, the longtime Benedetto endorsee introduces us to the latest love of his musical life, his new, gorgeous white Benedetto Bambino archtop jazz guitar. Dovetailing perfectly into Standring’s romance with the Bambino is the life-changing experience of taking a lesson in 2015 with one of his all time guitar heroes, Pat Martino. Standring was in Martino’s hometown of Philadelphia for a show and invited the legend and his wife to see the gig after spending part of the day together. Martino’s multi-decade career has been steeped in everything from post bop and fusion to mainstream and soul jazz. Having a deep conversation with Martino and listening to him play in an intimate, one on one setting planted a seed in Standring’s mind that he had probably been holding his true essence in throughout his entire career. Going into the lesson, he knew it might kick his a**, but he was looking for fresh new vibes to get excited about. Standring’s time with Martino led to the perfect breakthrough. Over the course of Standring’s nine hit albums since the late 90s and hundreds of live performances throughout the U.S., UK and beyond, he’s worked with some of the jazziest, funkiest musicians in the business. Becoming a great sonic architect and producer by necessity, he instinctively knows the perfect players to achieve specific sounds. Ten is driven by three key elements, those electronic DJ sounds and live instruments with Standring playing his jazz guitar on top. The consistent, seductive pockets are always foundational, so the album’s ten tracks feature those artists the guitarist felt could best convey the essence of the piece. Bassists Dan Lutz (acoustic) and Andre Berry (electric) pair perfectly from track to track with Chris Coleman, Dave Karasony and Sergio Gonzales. Dino Soldo handles the sly horn dips and swoops on the trippy electronic soul jam “Snake Oil” and the sly, atmospheric romance “Parisian Blue”. While Standring handles a lot of the keyboards and programming himself, he finds perfect guest spots for Rodney Lee (whose Hammond B-3 helps create an organ trio vibe on the hard driving soul-fusion “Like This, Like That”), Jim Wilson (who adds acoustic piano elegance to the sensual and intimate “Carousel”) and Jeff Babko (who adds meditative depth to the easy shuffling “Magic Carpet Ride via his sparkling Fender Rhodes). After establishing himself as a popular mainstay in the contemporary urban jazz genre with infectious R&B driven hits like “Cool Shades” (from Velvet), “Hip Sway” (title track from his 2000 album), “Ain’t Mad Atcha” (2003’s Groovalicious) and “I Can’t Help Myself” (from 2006’s Soul Express), Standring decided it was time to push his muse into offbeat and uncharted territory. His appreciative fans, radio programmers and critics fully embraced Blue Bolero (whose single “Bossa Blue” was the #1 Billboard Contemporary Jazz Track of the Year) and Send Me Some Snow, an inviting holiday collaboration with award winning pop/folk singer/songwriter Kathrin Shorr. The guitarist grew up in the small town of Aylesbury in England, later studying at London College of Music (where he played with the National Youth Jazz Orchestra and received a Fellowship Diploma) and writing music for the BBC and for several theatrical orchestrations before moving to Los Angeles in February of 1991. After establishing himself on the competitive local contemporary jazz scene with extensive club gigs, he hooked up with Rodney Lee when the two played in Lauren Christy’s band. In 1996, Standring, working with Lee under the name Solar System, honed in on the R&B driven jazz sound that would become his trademark; their acid jazz oriented self titled album featured vocal covers of “Walk on the Wild Side” and “Me & Mrs. Jones.” After launching his recording career the traditional way, on established jazz labels, Standring started his own company Ultimate Vibe Recordings, on which he has released each of his albums since Love & Paragraphs in 2008. Perfect combination? Sounds like a perfect Ten.